When in the sunny Algarve, you will see all around you on the Ria Formosa the distinctive rectangular pools from which natural sea salt is collected. 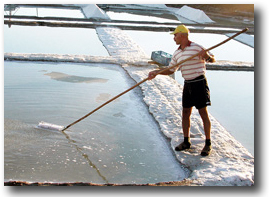 The finest Algarve sea salt known as Flor do Sal has been produced here since Roman times and before. Today the tradition is carried on, most notably by Marisol at Tavira, who use only the traditional methods of production, collection, drying and cleaning before sending their entirely natural product around the world. 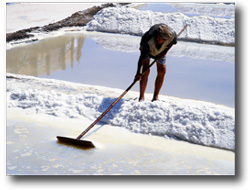 Join one of Algarve Golf Holidays Tasting Tours day trips to see natural sea salt harvesting and processing in the Algarve Portugal. And taste some too!